Much has been said about Sigma's new cinema lenses - both good and bad. Particularly their high speed zooms, the 18-35 T2 and 50-100 T2. 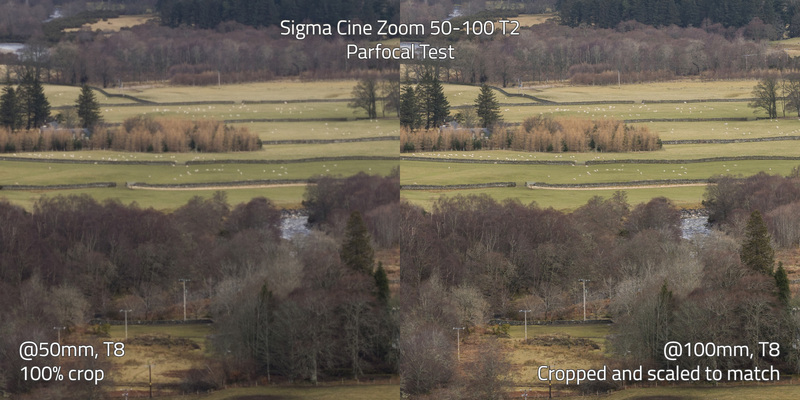 Sigma recently loaned me a pair of the zooms for use on a project in the Scottish Highlands and so I took the opportunity to get to the bottom of things myself and find out the truth about the Sigma lenses. Firstly, let's recap what these lenses are. In 2012, Sigma seemingly underwent a complete transformation - from typical third party manufacturer to premium quality brand virtually overnight, with the release of their 35mm f/1.4 from their now fabled 'Art' series of lenses. Ever since, almost everything that comes out of their doors rivals and even beats, optically at least, typical industry favourites from Canon, Nikon and even Zeiss - and at a fraction of the cost. Now pioneering optical design, Sigma have produced a number of unique and unrivalled products which, in addition to their excellent prime lenses, include a number of zooms such as the 24-35 f/2 and 120-300 f/2.8. Sigma also made a pair of super fast zooms for APS-C format, the 18-35 f/1.8 and 50-100 f/1.8. In 2016, Sigma announced they would enter the cine market and produce a range of primes and zooms for filmmaking use, and these two zooms were included in the initial line up. Keeping the optics but featuring a completely new body, the 18-35 T2.0 and 50-100 T2.0 are indeed rehoused stills lenses - Sigma openly admit this. They are however, keen to point out that some mechanical improvements have been made. Before the Cine versions were announced and released, the stills lenses were popular for filmmakers given their low price point, fast speed and optical performance. They did however, have a reputation for focus breathing quite heavily and, like most photography lenses, are not parfocal. Officially, both of these points have been addressed and improved in the cine versions, however there is still a lot of doubt in many people's minds and online in general, about how good (or bad) these lenses are. I'll begin my findings by confirming what everyone already knows and others have already stated. Optically, they perform excellently, resolving extremely well, even wide open at T2.0. It is also worth noting that at this price point, this aperture is completely unrivalled in a zoom. For a zoom, this is blisteringly fast and is only matched by Angenieux's EZ series (each costing more than twice the Sigmas) and Fujinon's HK Premier zooms (well over 20 times as expensive). Previously I have written about the advantages of shooting exclusively with zooms and being at least one stop faster than anything else is another huge bonus. The shoot in which I took the Sigma zooms involved hiking into remote locations and up mountains and as such, both weight and speed of shooting was a factor. I opted not to bring any primes with me at all, relying entirely on the two zooms. Using these lightweight, fast zooms in remote locations was a big advantage. The look of the Sigmas could be described as neutral. Not only are they very sharp, but clean throughout the frame with no noticeable aberrations. Bokeh is smooth and uniform; these lenses are more reminiscent of Fujinon's cleanliness than Angenieux's characterfulness. Even against extremely high contrast edges, there was no chromatic aberration and only minimal halation. And now for the more critical part of the review. Parfocal and focus breathing. Officially, these lenses are not parfocal, though they're not as bad as the stills versions. Not being parfocal may be a deal breaker for some. For any zooming during a shot, from a slow tense creep or a dramatic crash zoom - the ability to retain focus throughout the zoom range is an important facet for filmmaking. Shooting a wide and very quickly punching in for a close up of the same subject is often crucial in fast paced filming environment. Focus breathing is when the angle of view changes as the focus is racked from one distance to another - essentially zooming in or out just by focusing. The stills versions were known for breathing "like a 40-a-day smoker", and again, although this has been tackled with the cine versions, breathing is still evident. Whilst I had the scenery at my disposal, I decided to shoot some tests to see for myself how far off parfocal the lenses were along with how badly they breathed. This view offered lots fine detail to examine. I didn't shoot any test charts or the like; all of the following is 'real world' testing. All of the images were shot at 6k on a Sony a6300 with identical settings. Shutter release was on a 2 second delay to prevent any camera shake. The only processing the images have seen is basic contrast/exposure correction; absolutely zero sharpening has been applied. Any change in exposure between shots is down to variable cloud cover. Everything is shot at T8. The decision to pick this aperture was to optimise sharpness without suffering from diffraction - plus, for the focus breathing shots, the image is still discernible when out of focus. In hindsight, admittedly I should have probably shot the parfocal test wide open as this will likely highlight the flaws more prevalently, though equally, this probably demonstrates a 'best case' scenario. 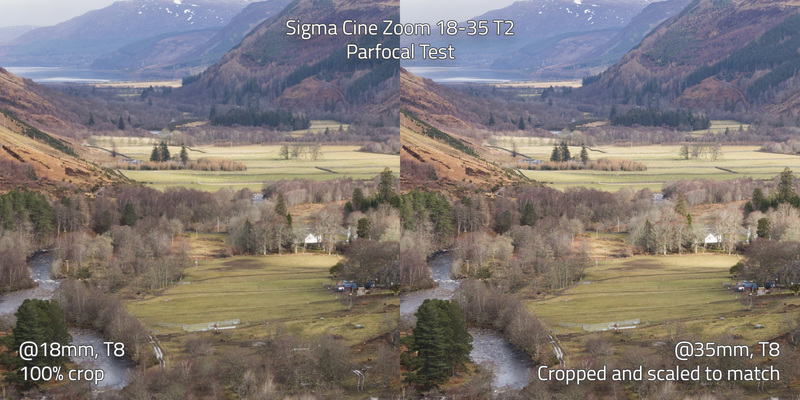 The parfocal tests were manually focused to the very centre of frame (namely the sheep in the field) with the aid of focus magnification. A frame was taken whilst zoomed in, then zoomed out and without touching the focus, another photo taken. A 1000px square crop from the centre of the wide frame is then compared against a crop of the exact same area from the long frame. Granted, the long view has the advantage of being downscaled, however it objectively compares the shift in focus when zooming out. The full resolution images (6000x4000) are available to analyse yourself should you wish, by clicking on the images. A red square marks the sample area. Left: 18mm at 100%. Right: 35mm cropped and scaled to match the framing. Click to enlarge. Left: 50mm at 100%. Right: 100mm cropped and scaled to match the framing. Click to enlarge. As you can see, whilst neither lens is absolutely parfocal, they're not far off. I'd describe them as soft more than simply out of focus. The 18-35 clearly handles it better than the 50-100 which exhibits a larger shift. Interestingly the 35mm and 100mm frames are good examples of just how razor sharp these lenses can be. At 100mm in 6K, you can make out individual legs on the sheep - which are over 2km away! Next is the focus breathing test. The lens was set to the infinity mark, the 6ft mark and the close focus mark. The 18-35 shows nearly no signs of breathing whatsoever - which is a good thing. Whether this is still the case wide open I couldn't say for sure; unfortunately I didn't have the time to conduct a more thorough test. The 50-100 however, exhibits very severe breathing. At 50mm, take note of the mountain's peak and the bend of the river. At 100mm look at the river again, and the loch in the top left. At close focus it almost completely disappears! As you may have noticed, in my haste to test these lenses whilst shooting a project, I have forgotten to test the breathing at 18mm. Sorry about that. Looking at the other lens however (whose performance is similar at both ends of the zoom) it's a fair guess that the 18-35 will perform similarly on the wide end as it does at the long. If I have the opportunity again, I'll be sure to conduct a more rigorous test that includes checking for breathing at 18mm and shooting everything wide open for both the breathing and parfocal tests. For now these frames will have to suffice though I daresay that they still provide an eyeopening insight into these lenses' performance. So, these lenses aren't quite parfocal - but are largely acceptable depending on what you're shooting. Further on this topic however, it is well worth reading Roger Cicala's blog on Lens Rentals about parfocal lenses and Matt Duclos has written a piece specifically about these Sigma lenses and whether they're parfocal or not. More of a problem however and less well discussed is the focus breathing. Whilst I cannot speak with authority (having only tested the zooms), I believe the primes also breathe a fair bit too. By Sigma's own admission, the 50-100 is the worst offender of all of their lenses, so expect the primes to fare better. More lenses will breath than not - even if only a little, when racking from close to far or vice versa. This applies even to lenses built for cinema and are not rehoused/repurposed stills lenses: even Ultra Primes for instance, breathe somewhat. And finally, onto a few other thoughts I've had and observations I've made about these lenses whilst in use. Firstly, they look great. 10/10 for aesthetics! Sigma claim they're weather sealed too. One of the other interesting features is that they feature luminous markings. That's great - except by default, none of the witness marks are luminous. Only the branding on the side and, oddly, the index marks (for aperture, zoom and focus) are finished in glow in the dark paint. To reiterate - your aperture, zoom and focus numbers do not glow in the dark, rendering the luminous markings pointless. Clarification from Sigma suggests that they do offer fully luminous marks however this is an additional cost. When designing these lenses, Sigma opted for a 180 degree focus throw - typically much shorter than many cine zooms whose focus ring rotates often up to 300 degrees. This was done to strike a balance between the fine accuracy of using a follow focus and the ability to manually focus with one twist of the wrist - and not needing to turn the ring several times by hand. I think this is a great idea and agree that it works well - I used the lenses without a follow focus and pulled focus by hand and not once did I have a problem trying to stretch or reach around the lens to complete the pull. However, I wish they had considered the same thing for the zoom ring. Both being short zooms (18-35 has a x1.9 zoom range and the 50-100 is x2), they feel more like variable primes than typical zooms (their speed and optical performance certainly suggest as much anyway) and yet their zoom rings feel far too long. Because of their range, I found myself using one end or the other most of the time; only rarely using in-between focal lengths. Most importantly however, with the long zoom throw, it isn't possible to crash zoom. For dynamic shoots that benefit from a cool crash zoom now and again - like the music video I was shooting - it is very difficult to zoom in quickly or to any distinctly different frame size. All lens design ultimately comes down to compromise. The issues I faced with these lenses I may not have with others, though equally those lenses may have other limitations of their own that these may not. The focal lengths covered with this pair of lenses feels too short to make the most of the benefit inherent with using zooms over primes. There is a gap of 15mm in focal length between the lenses; whilst it isn't a deal breaker, I prefer a slight overlap that is for instance present in I think all of the Angenieux short zoom pairs. Better yet than this however is an all in one zoom like the Fujinon 19-90 or Canon 17-120, though of course the tradeoff is size, weight, speed and cost. It wouldn't be possible to make a T2.0 zoom in a longer zoom range without increasing the size, weight and cost exponentially. The Sigmas' real standout features are it's speed and optical performance: as aforementioned, they are perhaps more suitable as variable primes than run and gun zooms. In summary, the parfocal debate isn't nearly as big of a problem as everyone makes it out to be, however the focus breathing is. The 18-35 is better than the 50-100 in both of these regards. Optically the lenses are superb though you can't crash zoom and luminous marks cost extra. If you're doing more cine work than documentary then these lenses might well be ideal for you - all the more so given their attractive price, though won't be suitable for everyone or for every project.